A dry mouth can often be a condition related to diabetes. It can be very inhibiting as well as irritating and uncomfortable! When you need instant relief from dry mouth DiaClin’s dry mouth spray should be the first thing you reach for. What is DiaClin Mouth Spray? It’s a unique oral care product based on the 2QR-complex which prevents bacterial infection of the mouth by blocking harmful bacteria from binding to tissues and relieves discomforts such as dryness and soreness. Sufferers of diabetes often experience the effects dry mouths can bring due to the insufficient production of saliva. 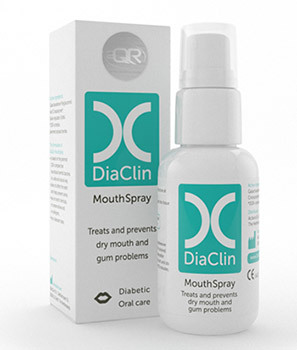 DiaClin Mouth Spray solves the problem by stimulating the production of saliva and restoring the natural balance of the oral micro-flora. A healthy oral cavity prevents bleeding gums, plaque formation and ensures an odour free breath. Fresh taste – no nasty bitterness! For effective application simply spray the liquid directly into the mouth. DiaClin Mouth Spray effectively and efficiently restores the microflora of the oral cavity and prevents problems from becoming more serious. You can use the spray every day as much as you desire. The pocket sized bottle is ideal to be kept in your bag or pocket for a quick spray on the go or tucked away in your medicine cupboard.